While this race may not have been my brightest idea, in terms of where I am at in my training; it was most definitely a fun one! Every time I think of training and running a road 26.2 I reject it. But ask me to do an ultra and apparently I am on board. Even though I am not really trained for one. I have been half-assing long running lately. While I do have a few LONG runs in - a 22 and an 18 miler fairly recently - other than that my runs have not been longer than I think 12 miles. My goal going into this race was simple, do whatever my body permits. I genuinely have no desire to injure myself and was willing to pull the plug on running if something didn't feel right or I was just shot. Walk if and when necessary, and also chill for a minute or so at the aide station each loop. The course itself was about 1.45 miles (love a good loop on a timed ultra) which meant you hit the aide station pretty frequently. I didn't taper or anything since like I said, no goals and really didn't prep. Taking this seriously folks! I liked that it was a night race. It began at 4pm and ended at 10pm, so I got a fantastic night of sleep, 10 HOURS, and also could be lazy ahead of time. A nice change of pace. I got there and was happy to see a lot of familiar faces. This was my 4th event with the Broadway Ultra Society, and you walk up, they know your name, they know your race history and it is just a chill vibe. I debated what to wear - decided on a long sleeve under my team singlet, shorts and calf compression sleeves, and just hydrated a bit more and waited to begin. I think there were about 50-60 or so participants. It is all very official in the beginning. Richie who runs BUS goes over the rules and the loops, lead us to the official start line and basically said, go! Brings joy to my heart how chill these events are. The course was comprised of 2 loops - a lower and an upper. It had one killer incline, which I walked each time, which then was a killer decline on the way back, plus one other pretty good decline. Other than that mostly flat with little bits of elevation. The park itself was nice and only a few miles from home so I am going to plan some long runs around it this spring for sure! My race strategy was to just go at "all day pace". For me that means maintaining conversational pace and low heart rate. For reference my average heart rate for this was 127 bpm. I started running and got in a zone. For me with these timed events I feel like the most mentally challenging part is getting past the first couple hours. When you know you have a timed end vs a distance end, it is ticking down the hours along with miles. I felt good. As the miles went on I will say I was waiting for my body to just say no. When I hit a half marathon I was surprised I didn't feel fatigued. But again I was running really slow. From there on out I took it loop by loop. At 16 I started thinking that a marathon was doable. 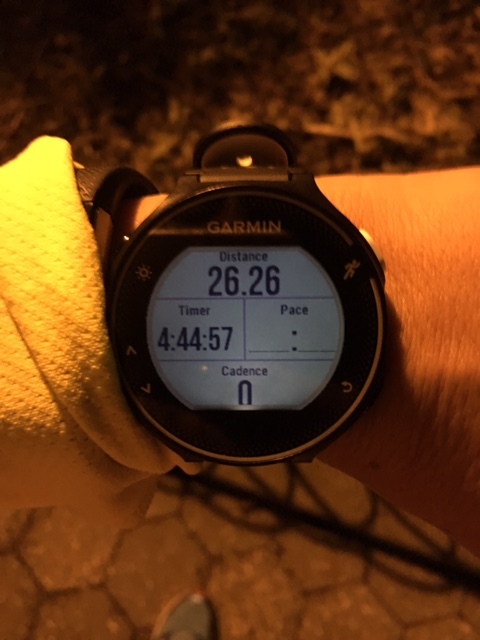 By 20 I knew there was no stopping, that no matter what I would make it to 26.2 even if I walked. It had also rained a bit on and off and was starting to get colder and windier - they had soup at the aide station and that was basically my motivation the last 10K to keep moving. The scoring volunteers are also your biggest support. Each lap they are routing you on and as I got closer to the marathon they were counting down the laps for me (18 was a marathon). The last loop I did start to feel some aches and was thankful that I was just about done. I was definitely thinking, is this normal marathon aches or is something hurt, trying to keep myself honest. And then, loop 18 was DONE and a marathon was in the bag! In a not too shabby time if I do say so myself. In general this isn't a worst marathon time for me when I have been TRAINED. And I walked. And stopped. And was genuinely running slow. ALMOST tempts me to train to PR a marathon (mine is 4:26) but pretty sure I won't lol. I then stopped an got my very looked forward to chicken noodle soup with LOTs of noodles. Oh the salty goodness. I sat and stretched for a little while and then decided I would just walk in the remainder to keep moving for the 6 hours. I wound up finishing with a couple more loops for about 29 or so miles. We then headed for a little pizza and awards party after, and were able to warm up a bit. I would like to say that there are some AMAZING runners you are in company of in these events. The top male ran 49.5 miles. Let that sink in. A 7:15 or so pace for almost 50 miles. The top female I believe had 43 or so miles. So while I totally impressed myself with what I was able to do, there are some very awesome ultra runners out there. Two of my new teammates did it as well, running about 38 and 32 miles respectively. The aftermath? A solid 8 hours of sleep later and I woke up not feeling too bad. I am going to definitely spend the day not too anything more than some walking since sitting too long will make me stiff but not worse for the wear going beyond what I have done lately. What works for me is clearly not any sort of suggestion for what works for others. I am not injury prone, I have maintained a base for years. I literally have not had to "restart" training in several years. I have a great cardio level of fitness - this is not to sound like bragging but the fact that I was able to run for several hours, all at low heart rate, speaks to my current level of fitness. I genuinely think that one day I may wind up fully immersed in the ultra world. I think that I am totally made for long and slow running and enjoy it as well as the camaraderie. But I'm not ready to give up on my speed yet, and if I have learned anything it is that for me, when I start to focus on long I sacrifice speed. This probably will not be the last time I jump into a distance race without focusing on training for it. Wow! That does sound like a lot of fun even if not advisable by a running coach. Clearly you have a really strong base to be able to pull something like this off. It's great that this has piqued your interest even more in doing Ultras. I'm thinking that if my body could handle the distance, the ultra world would be for me. I know I need to give up my speed for long and slow. Sounds like you did really well! Congrats!